Constituent analysis is one of the basic skills required of prospective specialists in German studies and is therefore a mandatory component of university teaching. The textbook offers a detailed overview of the theoretical concepts and terminology of constituent analysis, which are explained by way of numerous applied examples and sample analyses, and supplemented by exercises and an index. As a result, the book provides the reader with a universally applicable tool for accurately identifying individual constituents (main clause, subordinate clause, object, predicate, attribute, etc.) and can also be used for self-study. 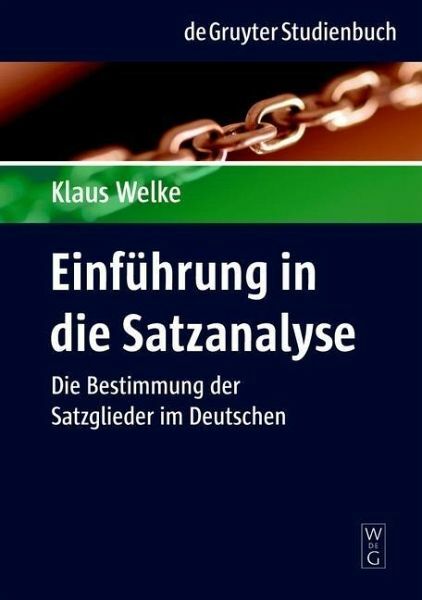 The book also gives well-founded insights into the syntactic structure of the German language and facilitates language comparison in foreign language teaching. Although the book is especially intended for students, it will also serve as a fundamental teaching aid for student teachers, as well as teachers and instructors of linguistics. 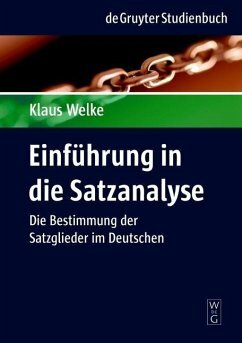 Klaus Welke, Humboldt Universität zu Berlin und Universität Wien, Österreich. Klaus Welke, Humboldt Universität zu Berlin undUniversität Wien, Österreich.